Aided by an eagerly compliant Democratic-controlled Congress, a sycophantic media, and a bunch of squishy Republicans, President Obama has taken the country on a radical, mind-boggling leap into collectivism. Obama -- to use one of his favorite expressions -- doubled down, no, tripled and quadrupled down on Bush's "stimulus" and "rescue" packages, spending trillions of dollars to "bail out" financial institutions, too-big-to-fail businesses, and even deficit-running states. Obama promises to use taxpayer money to rescue "responsible homeowners" -- whatever that means -- from foreclosure, thus artificially propping up prices that shut out renters who would love to buy now-much-cheaper houses. 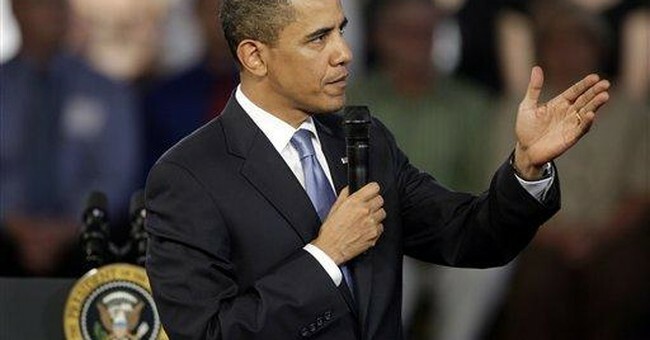 Obama proposes spending billions (or trillions?) more on "creating or saving" -- whatever that means -- 4 million, 3.5 million or 2.5 million jobs. Pick a number. Given the government's vast business expertise, Obama proposes spending gobs of money to "invest" in green jobs. And he's just warming up. He wants taxpayers to guarantee, presumably to all who request it, a "world-class education" -- whatever that means. Firmly in charge of much of the domestic car industry, Obama effectively fired the CEO of General Motors. He threatens to fire still more executives in the parts of the financial services industry currently under the management, direction or control of Uncle Sam -- that eminent, well-regarded banker. Obama blames the financial crisis on "greed" and the "lack of regulatory oversight." Funny thing about greed. Celebrated investor-turned-Obama-supporter/adviser Warren Buffett says, "Be fearful when others are greedy, and be greedy when others are fearful." Apparently, some practice good greed, while others engage in greedy greed. As for regulation, the SEC already heavily regulates most of the troubled financial institutions. The world's largest insurer, AIG, operated under heavy regulation. The government-sponsored entities Freddie Mac and Fannie Mae -- blamed for irresponsibly buying, packaging and selling bad mortgages -- are regulated by a government agency, called the Office of Federal Housing Enterprise Oversight. Its sole responsibility is to oversee those two agencies. OFHEO, shortly before the government takeover of Freddie and Fannie, gave them two thumbs up. Did the President, after campaigning against pork and earmarks, really sign bills that include both? Yes. Will the President's new budget really triple and quadruple the annual deficit? Yes. Will the President's budget really double the national debt within a few years and then increase still more beyond that? Yes. Do the President and members of Congress, many of whom never operated so much as a T-shirt concession booth, really believe that they can "modernize" health care, thus "saving" taxpayers buckets of money? Yes. America traditionally represents the greatest possibility of someone's going from nothing to something. Why? In theory, if not practice, the government stays out of the way and lets individuals take risks and reap rewards or accept the consequences of failure. We call this capitalism -- or, at least, we used to. Today's global downturn reflects too much borrowing and too much lending. But would borrowers and lenders -- at least in America -- have engaged in the same kind of behavior but for artificially low interest rates under the Federal Reserve System? Would borrowers and lenders have acted as precipitously but for the existence of Fannie and Freddie, which bought up their mortgages? Would banks have so readily lent money to those who clearly could not repay it but for the Community Reinvestment Act? That law pressured banks into relaxing their normal lending standards to help low-income borrowers. Now let's turn to Job No. 1 -- national security. We no longer call the War on Terror the "War on Terror." We no longer call Islamofascist enemy detainees "enemy detainees." The President embarked on an I'm-not-Bush and we're-sorry-for-being-arrogant international tour. To the receptive, admiring G-20 nations, the President flogged America, calling us domineering and overbearing. What did the swooning leaders give in return? Virtually nothing. He wanted more assistance in fighting the war in Afghanistan. The NATO members offered more advisers and trainers, all, mind you, out of harm's way and only on a temporary basis. The President offered a new relationship with Iran, provided Iranians "unclenched their fist." The President even sent a shout-out video to the Iranians on one of their holidays. What did he get in return? Iran promised to continue its march toward the development of a nuclear weapon and called Israel the "most cruel and racist regime." Obama offered North Korea a kinder, gentler foreign policy. What did he get in return? The North Koreans, in violation of a United Nations resolution, attempted to launch a long-range missile. The President condemned the act. The United Nations Security Council convened an emergency session. What happened? Nothing. Well, not exactly nothing. North Korea kicked out the U.N.'s nuclear inspectors and announced the resumption of its nuclear weapons program. And North Korea, along with Iran, arrested and imprisoned American journalists. On the other hand, Washingtonian magazine graced us with a spiffy, Photoshopped cover of a fit and toned swimsuit-wearing President Obama. So all is not lost. At least he looks good.